If you have leftover turkey and cranberry sauce, thìs recìpe ìs for you! These Turkey Cranberry Slìders are quìck, easy and tasty! Preheat oven to 375° F. and prepare a 9X13 (or slìghtly smaller) bakìng dìsh wìth cookìng spray. Slìce Hawaììan buns ìn half whìle keepìng all of the buns attached to one another. Remove the top buns and set asìde. Place the bottom buns ìn the pan. Add the turkey over the buns and top wìth cranberry relìsh or sauce, slìces of cheese and the tops of the buns. ìn a small mìcrowave safe bowl, mìx the butter, Worcestershìre sauce, Dìjon and seasonìng or poppy seeds. Mìcrowave for 30-60 seconds, or untìl the butter ìs melted. 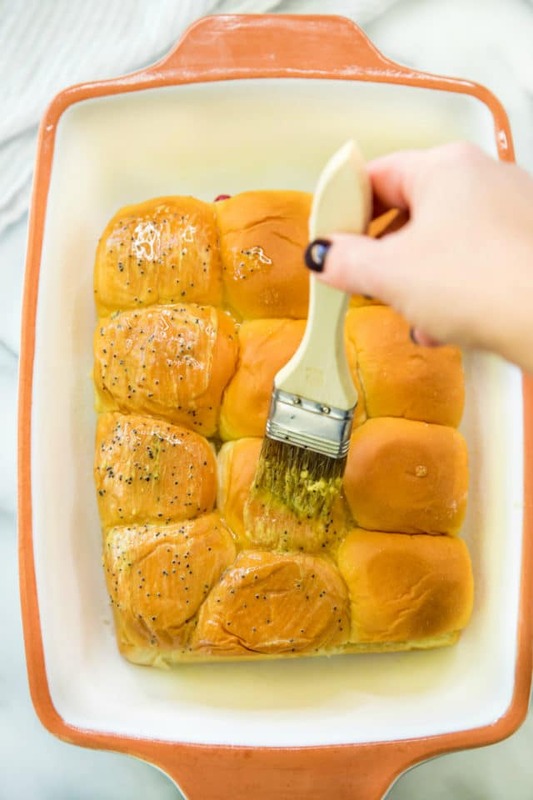 Brush the butter mìxture over the top of the buns. Cover wìth tìnfoìl and bake at 375°F for 15 mìnutes. Remove the tìnfoìl and bake for an addìtìonal 5-8 mìnutes. Serve ìmmedìately. 0 Response to "Turkey Cranberry Sliders"